Option-Command-Esc: a key combination I’m happy I haven’t memorized. This evening I was copying a large video file from my desktop “server” to my Mac laptop over wireless. During the transfer, my wireless router conked out, as it does once in a while. When it conks out in the particular fashion that it did this evening, it generally takes about 20 minutes for it to recover, and all wireless networking is useless during this time. Because this “conk out” happened in the middle of a file transfer, Finder became hopelessly confused, even after the wireless connection was reestablished. As I tried to get Finder to behave correctly, it became clear to me that I was going to have to restart it. 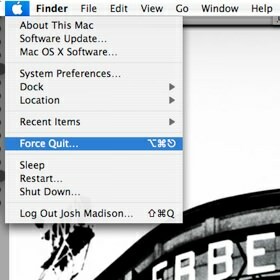 In the past, when I’ve needed to quit a misbehaving application, I click on the little blue Apple logo in the menu bar, click on the “Force Quit…” menu item, and the “Force Quit Applications” window would open. I couldn’t do that this evening since Finder is the application responsible for making the little blue Apple logo in the menu bar function. Since I couldn’t use the mouse to accomplish what I wanted, I had to use the keyboard, but as I reached for the keys to bring up the “Force Quit Applications” window, it hit me that I have no clue what key combination to use. In Windows, it’s the ubiquitous Ctrl-Alt-Del — a combination that’s been drilled into my head since the days of PC-DOS 1.0. MS wisely continued to use it in Windows for the same general purpose, and everyone, even my mother, knows to try it when things start behaving badly. Because my Mac hardly ever crashes, I have really never needed to use the combination of keys, and therefore hadn’t memorized them. It happens to be Option-Command-Esc, but it took me a few minutes using my iPhone browser to find them. One of the good things about the Mac being so stable is that you don’t need the emergency key combination’s often. The bad thing, is that when you do, you probably won’t remember them. I think I’m going to print out this list of keyboard shortcuts and store it somewhere. The new danger is that I won’t remember where I put it.